Natural, Vegan, Organic water soluble nitrogen (N 7%). Provides enzymatically processed vegetable peptides. Meets instant nitrogen demands and supports plant growth. Provides spectrum of L-Amino acids - the precursors for enzymes. Provides chelation with nutrients and specially phosphate and crop care products. Improves agrochemical performances when applied as tank mix. Provides nutrition to beneficial microbial population when applied in soil. The product is recommended in foliar and soil applications. Provides instant Organic nitrogen source to plants. Enhances crop growth, flowering and yields. Enhances performance of agrochemicals in tank mixing. 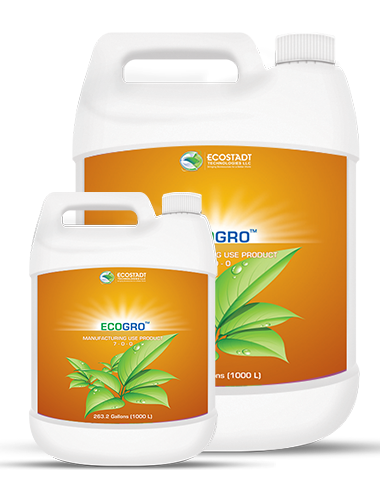 ECOGRO is only for manufacturing purposes and is not intended for sale as an end use product. 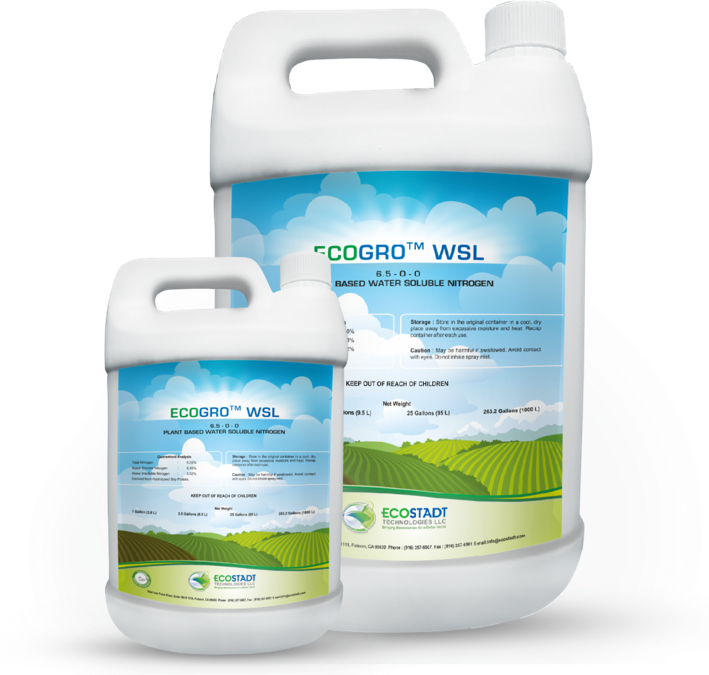 Use ECOGRO only as an ingredient in products formulated for use on plants. A vegan, Amino acid rich Organic Nitrogen Fertilizer. In the form of liquid (N 7.0- 7.5%N). Derived from non GMO Soybean with vegan enzyme hydrolysis. Minimal (or) no biological odor, a feature preferred by applicators and growers. Provides 45 % protein and peptides with 40-42% in the form of L-Amino Acids and acts as an effective biostimulant for plants. Contains full spectrum of L- amino acids which act as precursors for growth enzymes and yield improvements. Serves as an exceptional natural nitrogen fertilizer and biostimulant. Fulfils crop amino acid deficiencies and help crops achieve pest & disease resistance. Promotes soil microbial growth and improve root growth and root zone health. Improves the biological activity of microbial bio-pesticides and conventional chemicals when tank mixed. A spray dry powder 100% readily water soluble with pH 4.5-5.0 range. Product approved by CDFA -OIM product in California with labelling for agriculture, turf, tree crops, gardens, hydroponics etc. Ideal as an Amino acid source for Organic and Conventional crops & as an Organic Nitrogen source for instant crop needs. The product can be safely stored for up to 24 months. Foliar use: Apply 1-8 Quarts per acre (1-8 liters). Multiple applications may be made 7-14 days intervals. Do not use more than 8 Quarts per application. Drip use: Apply 4-8 Quarts per acre (4-8 liters). Multiple applications may be made 7-14 days intervals. Sprinkler use: Apply 8–16 Quarts per acre (8-16 liters). Container and Nursery Plants: Apply 2-4 Fl. OZ per Gallon (60-120 ml) water as a soil drench application. Lawn and Home Gardens: Apply 1-2 Tbs. per Gallon (15-30 ml) water and make foliar (or) soil application. Provides instant source of organic nitrogen to plants. Enhances crop growth, flowering and yields. Acts as an effective biostimulant. Enhances biological performance of other agrochemicals in tank mixing.